Photographer, performance artist and New York downtown personality, by the time of his death in 1990, at age 39, from an AIDS infection, he had evolved two major bodies of work. He developed an artistic persona in the late 1970’s as a kind of Chinese dignitary or "Ambiguous Ambassador," complete with the classic Mao Tse-Tung suit, dark eyeglasses and an identity tag stamped "SlutforArt". Traveling around the USA and the world, he posited himself amidst stereotypical tourist sites, from the Eiffel Tower to Niagara Falls, from the Statue of Liberty to the Grand Canyon, ricocheting between nature and culture to develop an extensive and now-famous series of 100 silver gelatin self-portraits, entitled the Expeditionary Self-Portraits or East Meets West. These prints possess wit and humor, as well as great formal beauty in their investigations of issues ranging from the nature of tourism, tourist photography, and cultural identity. Tseng settled in New York in 1979 in the East Village, and soon after met Keith Haring and other in the East Village scene who became central to his life and work. With best friends Keith Haring, Kenny Scharf and Ann Magnuson, Tseng became a much-touted documentarian and denizen of the spirited New York downtown scene. He was Keith Haring's “official” photographer, creating an archive of over 40,000 images recording Keith Haring at work on public and gallery art, from his early subway drawings and his large scale commissions. Tseng worked in black and white as well as in color, in both candid and formal portraits of Andy Warhol, Jean-Michel Basquiat, Julian Schnabel, Peter Halley, McDermott & McGough, Francesco Clemente, among others of the 1980’s art scene. Tseng’s work has been exhibited in many solo shows including a major retrospective at the Center for Creative Photography in Tucson, which toured to numerous museums. His work is included in many solo, group, traveling exhibitions and biennales around the world. U.S. exhibits include Brooklyn Museum, National Portrait Gallery at The Smithsonian Institute, ICA Boston, MOCA Los Angeles, International Center for Photography, New Museum, Andy Warhol Museum, Bronx Museum, Asia Society; in Europe in London, Milan, Berlin, Amsterdam, St. Tropez and Madrid; and in Asia at the Shanghai Biennale and in Hong Kong. Tseng’s work is in many collections, including the San Francisco Museum of Modern Art, New York’s Guggenheim Museum, George Eastman House, New York Public Library, New School in New York, Museum of Fine Arts in Houston, Walker Art Center, Wellesley College Art Museum, Los Angeles County Art Museum, as well as in important collections: Rubell, Margulies, JP Morgan Chase, Hallmark, Dow Jones, Equitable among others. Award-winning hardcover monographs on his famous self-portrait series have been published, Tseng Kwong Chi: Self-Portraits 1979 to 1989 by Paul Kasmin Gallery for the solo show in 2008, and Tseng Kwong Chi: Ambiguous Ambassador by Nazraeli Press in 2005. 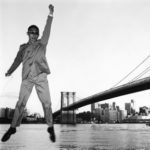 A major museum retrospective Tseng Kwong Chi: Performing for the Camera is planned for 2015 at the Chrysler Museum, Norfolk VA.
Left Hong Kong with family in 1966. Educated in Hong Kong; Vancouver, Canada; Montreal, Canada; Paris, France. Settled in New York City, New York 1978. Died in New York City, New York 1990. ”People and Places: Selections from the Allen Thomas Jr. Photography Collection”, Southeastern Center for Contemporary Art, Winston-Salem, NC. Norton Museum of Art, West Palm Beach. Visual AIDS November 2005 Web Gallery, curated by Lei Chou. Visual AIDS February 2005 Web Gallery, curated by Nayland Blake. Visual AIDS November 2004 Web Gallery, curated by Bruce Silverstein. "Our Quarter Century: The University of Arizona's Center for Creative Photography Turns 25,"
Kenny Scharf and Muna Tseng, Paul Kasmin Gallery, New York, NY, 2008. Ben Brown Fine Arts, London, England, 2008. Schlegel, Philadelphia Art Alliance, 2002. Tseng Kwong Chi, foreword by Richard Martin, Art Random, Kyoto Shoin, 1990. Keith Haring, Harmony Books, Crown Publishers,1984. 2011 Art in the Streets, MOCA Los Angeles, CA, Skira/Rizzoli 2011, pp. 58, 100-103, 290, 313. Keith Haring: 1978-1982, Contemporary Arts Center, Cincinnati, OH /Kunsthalle Wien, pp. 210-219. New York: A Photographer’s City, edited by Marla Hamburg Kennedy, Rizzoli 2011, pp. 10. Arts and Design, New York, NY, Prestel 2011, pp. 46. 2010 Dreamlands, Centre Pompidou, 2010, Paris, France, pp.156-157. Smithsonian Institution, National Portrait Gallery, 2010, Washington, D.C.. Brooklyn Museum, New York, NY, 2011, pp. 234-235, 246-247. Trespass: A History of Uncommissioned Urban Art, edited by Ethel Seno, Carlo McCormick, Marc & Sara Schiller, Wooster Collective, Tashen 2010, pp. 8. Jean-Michel Basquiat, by Enrico Navarra, Jean-Louis Prat, Johnny Depp, Achille Bonito Olica, Richard Marchall, Bruno Bischofberger, Galerie Enrico Navarra, 2009, Paris, France, pp. 6, 9, 17, 18, 23, 62. Kenny Scharf, by Richard Marshall, Ann Magnuson, Paul Kasmin Gallery/Rizzoli, 2009, pp. 6, 8-14, 18-20. Pop Life: Art in a Material World, edited by jack Bankowsky, Alison M. Gingeras, Catherine Wood, Tate Publishing 2009, pp.28, 64, 66-67, 125. Self and Other: Portraits from Asia and Europe, edited by Kenji Yoshida and Brian Durrans, Asahi Shimbun, Osaka, Japan, 2008 pp. 246. The Keith Haring Retrospective, Skira, Italy, 2008. 2007 Studio in the Street, Street in the Studio, Brattleboro Museum & Art Center, Vermont, 2007. Keith Haring: Works from the Navarra Collection, Enrico Navarra Editions, France, 2007. 2006 Keith Haring: Journey of the Radiant Baby, Bunker Hill Publishing, Piermont, 2006, pp. 8, 13, 17, 36, 44. The Jean-Michel Basquiat Show, by Gianni Mercurio, Glenn O’Brien, Annette Lagler, Demetrio Paparoni, Fondazione La Tirennale di Milano, Skira, Italy, 2006, pp.33, 34, 37, 38. The Andy Warhol Show, Skira, Italy, 2006. pp. 174, 222-223, 288. Press, Princeton; Oxford, 2006, pp. 21-22, 35, 84, 188, Cover. L’art a la Plage, Edition Enrico Navarro, Paris, France, 2005, pp. 97-112, 145-160. 2004 20 Years of Style: The World According to Paper, Hastreiter, Kim and Hershkovits, David, 2004. Shanghai Biennale: Techniques of the Visible, exhibition catalogue, 2004, pp. 76-79. Works from the Refco Collection of Contemporary Photography, Refco Group Ltd., 2004, pp.154-155. The Rubell Family Collection, 40 Years, essay by Mark Coetzee, 2004, pp. 30, 32-33.
catalogue, International Center of Photography, New York, Abrams, 2003, pp. 38, 58, BC. Gallery, Smithsonian Institution, Washington, DC, 2002, Image 82. Arizona, Tucson, AZ, 2002, pp. 212-213 and title page. 1999 On the Beaten Track, Lippard, Lucy, The New Press, New York, pp. 35-36, 1999. 1995 An American Century of Photography, The Hallmark Collection, text by Keith Davis, Hallmark Cards, Inc., in association with Harry N. Abrams, Inc., pp. 314-45, 353, 1995. 1994 Against Nostalgia: The Photo Images of Tseng Kwong Chi, Lowe, Donald M. 1994. Positions: East Asia Cultures Critique, Duke University Press, 1994. Asia/America: Identities in Contemporary Asian American Art, text by Margo Machida, The Asia Society, The New Press, New York, pp. 63, 1994. 1991 Site Seeing: Travel and Tourism in Contemporary Art, essay by Karen M. Higa, Whitney Museum of American Art, New York, 1991. Photography, ICP Midtown, New York, 1987. This is not a Photograph: Twenty Years of Large Scale Photography, John & Mable Ringling Museum of Art, Sarasota, Florida, 1987. The Avant Garde in New York, foreword by Serichi Tanka, Tanaka Studio, Inc., Tokyo, 1987. 1986 Images ‘86, Galerie Beau Lezard, Editions Rivages, Paris, 1986. Center, Flushing, New York, 1986. Art After Midnight, text by Steven Hagar, St. Martin’s Press, New York, 1986. Contemporain de Bordeaux, France, 1986. 1984 5/5 Figuration Libre France/USA, text by Otto Hahn, Herve Perdriolle, and Jeffrey Deitch, Musee d’Art Modernede la Ville de Paris, Paris. 2008 “Tseng Kwong Chi at Paul Kasmin Gallery,” Art in America, June/July 2008. “Tseng Kwong Chi,” ArtUS, Summer 2008. “Tseng Kwong Chi,” The New Yorker, May 5, 2008. “Tseng Kwong Chi,” Interview, April 2008. “Tseng Kwong Chi Opening at Paul Kasmin in NYC Tonight!” Paper, April 2008. “The Resurrection of Tseng Kwong Chi,” Paper, March 2008. McQuaid, Kate, “Inscrutable Chi,” The Boston Globe, September 13, 2007. “Tseng Kwong Chi,” Mao Mag, February 2007. 2006 Jones, Kristin M., “The Downtown Show,” Frieze, May 2006. 2005 “United States: our Selection A-Z,” The Art Newspaper, February 2005. 2004 Laster, Paul, “Suitable Attire Required,” Art AsiaPacific, cover and article, Fall 2004. Glover, Felicity, “The Accidental Ambassador,” Post Magazine, Hong Kong, September 12, 2004. Grumberg, Ariel, “Le Guide du Rout’Art,” BeauxArts, July 2004. Tong, Allan, “Floods and Imposters,” ricepaperonline.com, Spring 2004. 2003 Goodman, Jonathan, “Tseng Kwong Chi at Chambers Fine Art,” review, Yishu: Journal of Contemporary Chinese Art, December 2003. Yoshimoto, Midori, “Commodification of Buddhism,” review, Art Asia Pacific, Fall 2003. Balzer, David, “It’s Official,” Eye Weekly, www.eye.com, May 8, 2003. Johnson, Ken, “Who? Me?” The New York Times, January 10, 2003. 2002 Boxer, Sarah, “Photography Review,” The New York Times, November 22, 2002. Chinese Art News, November 2002. Lorber, Martin Barnes, "Tseng Kwong Chi: Ambiguous Ambassador," Asian Art, October 2002. “Art cue: Tseng Kwong Chi,” New York, October 21, 2002. Bach, Penny Balkin, "Lessons Learned," Public Art Review, Fall/Winter 02. Row, D.K., "Lost in America," The Oregonian, April 26, 2002. Habib, John Philip, "A Life in Chinese Drag," The Advocate, April 2, 2002. Shapiro, Howard, "The Ambiguous Ambassador," The Philadelphia Inquirer, March 28, 2002. Johnson, Ken, "Tseng Kwong Chi," The New York Times, March 1, 2002. Lewis, Francis, "Ultimate Tourist," Where, March 2002. Levin, Kim, "Voice Choices," Village Voice, February 2002. 2000 Stewart, Laura, "Collection Takes Viewers on Journey," The News Journal, October 29, 2000. Small, Irene V., "Spectacle of Invisibility: The Photography of Tseng Kwong Chi and Nikki S. Lee,"
Young, Clara, "Slutforart," Dutch, January/February 2000. 1999 Carr, C., "Just Visiting This Planet," Village Voice, March 9, 1999. 1998 Goldberg, Vicki, “Photography Review,” The New York Times, November 27, 1998. Cotter, Holland, “Art Review,” The New York Times, August 14, 1998. "Around Town," Time Out New York, July 1998. "Recommended Art-Chelsea Galleries," The New York Times, February 1998. 1997 Loke, Margaret, “Photography Review,” The New York Times, November 7, 1997. Kee, Joan, Artnet.com, October 1997. Regan, Margaret, "Eternal Tourist," Tucson Weekly, October 23-29, 1997. Pedersen, Victoria, "Gallery Go' Round," Paper, October 1997. Levin, Kim, "Voice Choices," Village Voice, September 1997. Cotter, Holland, "Tseng Kwong Chi," The New York Times, September 1997. Baker, Kenneth, "This Mao Uniform Traveled Well," San Francisco Chronicle, June 10, 1997. Perrott, Jeff, "Tseng Kwong Chi," artsMEDIA, April 1997. Turner, Grady T., "The Accidental Ambassador, " Art in America, March 1997. 1996 Isola, Marina, "Tseng Kwong Chi, East Meets West: The Expeditionary Series," Time Out New York, November 14-21, 1996. Schjeldahl, Peter, "Everywhere Man," Village Voice, November 19, 1996. Loke, Margaret, "Inside Photography," The New York Times, October 18, 1996. "Tseng Kwong Chi," New Yorker, October 1996. Dewan, Shaila, "Crossed Cultures," Houston Press, July 4-10, 1996. Lei, Boniya, Hsiung Shih Art Monthly (Taipei, Taiwan), May 1996. 1995 Bonetti, David, "Asian Artists Test U.S. Waters," San Francisco Examiner, October 20, 1995. Maclay, Catherine, "Immigrants' Art Shows Culture Clash," San Jose Mercury News, October 13, 1995. Baker, Kenneth, "Asian Immigrant Arts Revealed," San Francisco Chronicle, October 12, 1995. Van de Walle, Mark, "Site Santa Fe," Artforum, 1995. (Mexico), Volume 10, Fall 1994. Blinderman, Barry, "Tseng Kwong Chi," Photographers International, June 1994. "Goings on about town: Asia Society," The New Yorker, April 11, 1994. Wallach, Amei, "Immigrant Asians' Debut," New York Newsday, March 11, 1994. 1993 Aletti, Vince, "Voice Choices: Tseng Kwong Chi," The Village Voice, November 23, 1993. 1992 Wallace, Amy, "California-the Cultural Edge," The Los Angeles Times, November 18, 1992. Bonetti, David, review, "San Francisco Examiner, August 14, 1992. Chadwick, Susan, “Photos portray life in poor countries,” The Houston Post, April 1, 1992, p. D-8. Johnson, Patricia, C., “Satellite Photos,” Houston Chronicle, March 27, 1992, p. 4E. Satterwhite, Steve, “Jean Caslin,” Houston Press, March 19, 1992, p. 10.
Review of HCP exhibition, World Journal of Texas, March 6, 1992 (Chinese). Cunningham, Carl, “Dancer’s tribute unites art forms,” The Houston Post, March 5, 1992. Photography,” Photo Metro, March 1992, pp. 28-33. 1990 Hess, Elizabeth, The Village Voice, October 1, 1990. Bernstein, Stacey, “Spectrum,” ARTnews, Summer 1990, p. 39. “Artworld," Art in America, May, p. 273. 1989 "Cities," text and photos by Tseng Kwong Chi, Inside, Spring 1989, pp. 5,13 and cover. 1988 "Tseng Kwong Chi: Monuments and Natural Wonders," Aperture, Spring 1988, p. 16. Aletti, Vince, "Face Off," The Village Voice, July 7, 1987. Grundberg, Andy, review of "Portrayals," The New York Times, July 5, 1987. Aletti, Vince, "Voice Choices: Portrayals," The Village Voice, June 30, 1987. Schwabsky, Barry, Arts Magazine, May 1987, p. 107. Becker, Robert, "Modern Masters: Tseng Kwong Chi", Interview, May 1987, pp. 103-131. "The Rocky Mountain Maoist," Harpers, May 1987, p. 32. Hagenberg, Roland, "King Kwong: A Mock Chinese Tourist Discovers America,"
Artfinder, May 1987, pp. 86-87. L.A., "Tseng Kwong Chi: Casas Toledo Oosterom," 108: An East Village Review, March/April 1987. 1986 Martin, Richard, "East Meets West Meets North by Northwest: Tseng Kwong Chi in the Badlands and at Mount Rushmore," Arts Magazine, October 1986, pp. 72-73. Djanoumoff, Philippe, "Le Chinois Photographieur, Le Chinois Photographie,"
Gross, Michael, “Art of the Improbable: An East Village Exhibit,” The New York Times, Feb. 25, 1986. Handy, Ellen, "Leonid Sokov/Tseng Kwong Chi/Gregg Smith,"Arts Magazine, March 1986, pp. 142-143. Vandel, Philippe, "Le Chinois qui se Photographe Partout," Actuel, January 1986, p. 154. 1985 Engler, Brigitte, "Mr. Pop," Paper, November 1985. Mohri, Noriko, "Tseng Kwong Chi," Studio Voice, July 1985, pp. 54-59. Lombard, Christine, "East Meets West," Clichés, July 1985. Jenaer, Stephanie, "East Meets West," Clichés, April 1985, pp. 24-25. Holm, Stellan, "Vem Bar Vem, New York," Chic, April 1985, pp. 24-25. “Paris: Free Figuration,” ARTnews, April 1985. "Art in Transit," Heavy Metal, February 1985, p. 49. Breevette, Genevieve, "Figuration Libre a l’Arc, Effects Speciaux, Le Monde, January 1985, p. 15. "Figuration Libre, UneInvitation a la Culture Mass-Medias," Guide des Mentalites Nouvelles, 1985. 1984 Spitzer, Carolyn, "New York," City Magazine, December 1984, p. 13. "Mao Wow Wow," New York Talk, November 1984, p.19. "Art in Transit," An An, November 1984, p. 21. Chadakoff, Rochelle, "Front Runners," US Magazine, November 1984, p. 7. Miller, Donald, "What a Difference," Pittsburgh Post-Gazette, October 6, 1984. Lowry, Patricia, "'Paris/New York' shows a mixed bag," The Pittsburgh Press, October 4, 1984. May, Mike, "Paris on the Ohio," Market Square, October 3, 1984, p. 11. Ramirez-Harwood, Yasmin, "Subculture in Print," East Village Eye, October 1984, p. 35. Lowry, Patricia, "New Wave Art," The Pittsburgh Press, September 20, 1984, pp. c-1, c-9. “Arts Center Brings Together Artists from N.Y., Paris,” Market Square, September 19, 1984. Hershkovits, David, review of Semaphore exhibition, Paper, August 1984. Hagen, Charles, “Tseng Kwong Chi,” Artforum, April 1984. Handy, Ellen, review of Semaphore show, Arts Magazine, March 1984, pp. 36-37. Potpourri of Media, Themes," Buffalo News, February 12, 1984. Gorey, Mark, "Hallwalls/C.E.P.A.Beguiles, Entertains," Prodigal Sun, February 1984, cover & centerfold. Perdriolle, Herve, "Magie Noire, Magie Blanche," Beaux Arts, January 1984, pp. 55-59. Lorrain, Christine, Zoom (USA edition), January 1984. 1983 Lorrain, Christine, Zoom, (French edition), December 1984. Heller, Faith, Winston-Salem Journal, November 1983. "East Meets West," Flash Art, May 1983. Glueck, Grace, "Art: One Man's Biennial Assembles 102 Artists," The New York Times, April 15, 1983. Moufarrege, Nicolas, "Intoxication," Arts, April 1983. Moufarrege, Nicolas, "Tseng Kwong Chi and Rammellzee," Flash Art, March 1983. Moufarrege, Nicolas, "Found Objects and Found Space," New York Native, March 14-27 1983. Webb, Jane, East Village Eye, March 1983. McDarrah, Fred, Village Voice, February 1983, centerfold. Moufarrege, Nicolas, "The Famous Show," Flash Art, January 1983. 1982 Moufarrege, Nicolas, "The East Village: Another Wave," Arts Magazine, December 1982. Yale University, New Haven, Connecticut. Award for Distinguished Work, Asia American Arts Institute, New York City. 1986 "Keith Haring’s Party of Life III," The Palladium, New York City. 1982 "Scandinavia Today," The Clocktower, Institute for Art and Urban Resources, New York City. “The Kitchen Tour," Staten Island Ferry, New York City. "Space Invaders," P.S. 1, Long Island City, Queens, New York City. "Valentine’s Day," Stilwend, New York City. 1981 "Avalon Beach Patrol Lifeguard Ball," Wildwood, New York City. "Inaugural Ball," The Mudd Club, New York City. "Royal Wedding," The Underground, New York City. 1980 "Chinese Costume Exhibition," Metropolitan Museum of Art, New York City. "Artists and Models Ball," Danceteria, New York City. "First Invitational," Club 57, New York City. a New York Dance and Performance Award. New York, NY; Center for Creative Photography, Tucson, AZ.